Samsung’s track record when it comes to smartphone. You guys have been kind of missing, there was TouchWiz which was honestly bad then there was experienced UI which was better but not quite there. Well the One UI is here and it may just be the one. You will be able to Learn 7 Cool Samsung One UI latest features. Today we are here with Detail guide on the Samsung One UI latest features. 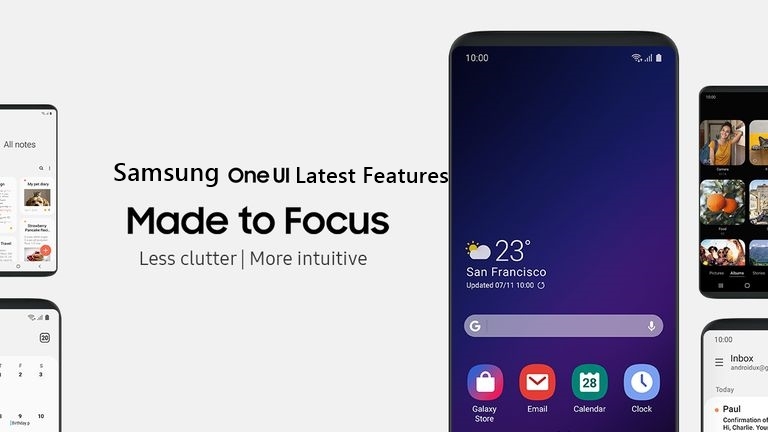 Samsung’s One UI brings a brand new UI thats seems very intuitive so the new One UI brings an interface that makes one-handed usage better and it’s not a surprise I mean it’s one UI after all so now there’s a viewing area at the top and an interaction area on the bottom half. So check out the new settings page next to the older one you can see the difference right everything is just cleaner and just easier to access. The notification shape it seems like your usual Android Pie. The new UI there are new icons here which look way better now but still a little too cartoonish from alike. Now with fact that this looks good it also makes up for a really comfortable viewing especially at night and since it’s big right into One UI. It works on the settings page the quick settings and all of Samsung apps with night mode is definitely an amazing new feature of One UI. Samsung also brings navigation gestures and if you’re expecting new out-of-the-box totally different gestures from One UI. The One UI gestures here are pretty simple so that’s good but they don’t seem as intuitive. So you can swipe up from the center to go home, you pull from the left to open up the recent and swipe from right to go back. When you accidentally delete photos and that’s where the trash feature in Google photos comes in so handy when One UI gallery app brings a new recycle bin feature which is very similar and very handy. When you first time delete a photo in this new gallery app. The App will prompt you to turn on recycle bin from the settings. Once you enable this, generated images and videos will remain in the recycle bin for 15 days before they are deleted forever. If you want to recover photos there is no album here for the recycle bin instead there is an option in the Three-dot menu button which takes you to the recycle bin. If you use the Iris scanner or the Face unlock on your Galaxy phone, right now you have to press the power button to turn the screen on and then the phone scans your eyes or face which is fine but One UI brings simple yet handy lift to wake gesture that should make things faster. You can enable it in the motion and gestures option in advance features and once enabled you can just pick up the Galaxy Note 9 and S9 and it just unlocks without you having to press anything. When you are shooting videos you generally turn off the screen mode of brightness and set the screen timeout to maximum so that the screen brightness does not change during short and the screen doesn’t go dim so we mostly forget to reset things which in turn drains the battery well. There is new optimized settings option in One UI battery settings which when enabled will automatically reset the brightness, screen timeout and media volume at midnight. Samsung keyboard also gets some cool new features with One UI. First of a new floating mode in the modes page of the keyboard and as the name suggests it makes you keyboard float. You can move it anywhere you want. You can also adjust the size of the keyboard, floating mode and the transparency. And also a new adaptive theme option which automatically changes the theme of the keyboard to light or dark depending on the color over. I hope you like a post on 7 Cool Samsung One UI latest features Tips & Tricks. If you have any Question then ask in the comment box. We can solve your problem.